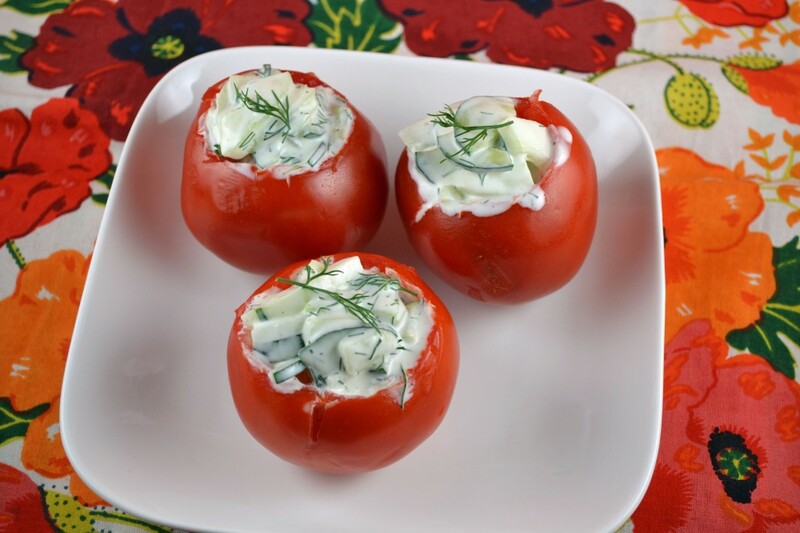 The original title of this recipe from “The Art of Good Cooking” is Danish Stuffed Tomatoes. However, when I tried to research this recipe, I found little on what makes them “Danish.” I decided to lighten the stuffing by using yogurt, making it more about the cucumbers and less about the overbearing amount of sour cream and mayo originally used. It now maybe considered more Greek than Danish since the stuffing is more of a basic tzadziki. 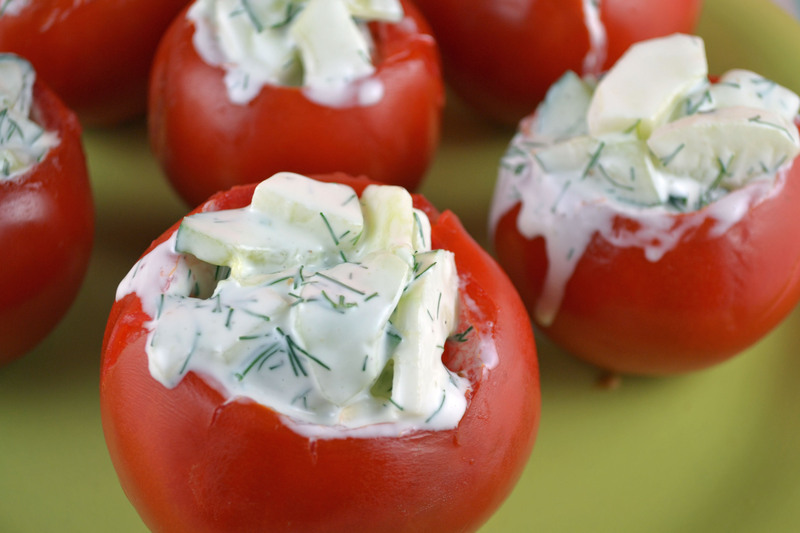 Creamy yogurt, garlic, and dill brighten the cucumbers that then add crunch to the soft juicy ripe tomatoes. This is a tasty little no bake/cook seasonal appetizer or side dish that presents beautifully. Peel cucumbers and cut in half lengthwise. With a spoon, scoop out seeds and discard them. Slice cucumbers thin. Place in a bowl, sprinkle with salt and place in refrigeration for at least 2 hours. Pour off water which has accumulated and press out any additional water so that cucumbers are dry. Add sugar and pepper and stir. Combine garlic, yogurt, and lemon juice. Pour over cucumbers and toss lightly, adding half of the dill. Place in refrigerator until needed. Remove a circle from the stem ends of the tomatoes. Carefully scoop out all the seeds and pulp. Turn the tomato shells upside down on paper towels so that any juice may drain. Stuff each tomato with the cucumber mixture. Sprinkle remaining dill on top of each tomato. One of my favorite foods are tomatos. I love them in any cook way. I love ur recipe! Thanks for sharing! !